This is for the long-term oriented investor, willing to refrain from an immediate return in order to get a higher than usual return over a long period in the medium-term future. In fact, rubber is in high demand, both presently and more even in the future. It can be produced from oil, a non-renewable, limited source or from rubber trees (latex), a renewable, natural source. With the oil resources getting smaller and smaller and the prices accordingly increasing on the long run, rubber trees are a highly promising alternative for the rubber production, an industry who's importance will only grow in the future. Right now, we have a Para Rubber Tree Plantation of approx. 10 ha for sale. 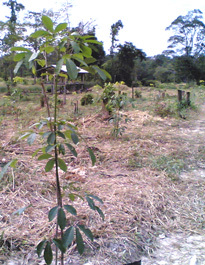 This plantation is situated in Bolikamxay Province with excellent access to National Road Nr. 13 and the Mekong River. There are approximately 5'000 trees on the plantation, planted and carefully taken care of about one year ago. The labour intensive and crucial "first year" is therefore already over. In the coming years, these trees need relatively little attention to grow to the point where latex can be extracted for the first time, about six years from now on. Presently, one kilogram of the rubber quality as our plantation will produce, is traded at 100 Baht. One "grown-up" tree can produce approximately 10 to 30 kilos every year. Based on today's prices and calculating with the worst case scenario of only 10 kgs/year, it can be estimated that once these trees are mature enough to be explored (hence in about six years), the yearly income for this size of plantation is about Baht 5'000'000, The cost of the work of actually gaining the latex and of taking care of the plantation can be estimated at less than B 500'000. The latex can be gained for approx. 20 years. This Plantation is now for sale or long-term lease for Baht 15'000'000. Of course, a management contract for the necessary "take care" of the plantation and the future work of extracting the latex can also be provided. This is an excellent opportunity for the short to medium-term oriented investor who prefers a straight forward "buy and sell later" investment and doesn't wish to be too much involved in the process of growing up and processing agricultural products. The Ketsana tree is used in the fragrance industry and relatively new to Laos, but already now there are two (foreign owned) companies in the region that are looking to buy Ketsana trees for their production. Presently, a Ketsana tree of approx. three years of age is traded for 1000 Baht. As the demand for trees exceeds the supply by far, the processing companies also look to buy only two year old trees that are presently traded at 500 Baht. 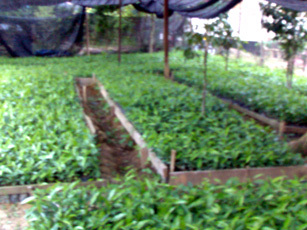 Buy today into newly planted Ketsana trees and sell them in about three years for a considerably higher price. We can offer you to buy the seedlings, plant them on our land and take care of them until they are mature enough to be sold (approx. within three years). The all-inclusive price per tree is Baht 150 (seedling, planting, provision of the necessary land, growing up, etc. ), the estimated profit after three years thus 600% (based on todays trading prices), rsp. 233% for two year old trees. An expected return of this magnitude clearly involves higher than normal risks and we would be happy to discuss these with you. Minimum transaction is 5'000 trees. In the village of Ban Bungguang, Bolikhamxay Province, we have a lot of 5000 m2 for sale. Ban Bungguang is situated directly on the Mekong river in Bolikhamxay Province, bordering to the south with Khammouan Province. It is connected to Route Nationale No. 13 by an approx. 5 km long road. Strategically, Ban Bungguang will gain considerably importance as less than 10 km to the north, a new international custom point will open, as part of a new route from Thailand to Vietnam (Vinh port). The Mekong can then be crossed by means of an all new big ferry boat service (suitable for trucks). The roads on the Thai side are already finished an well under way on the Lao side. Ban Bungguang being by far the largest agglomeration in this area will also be connected via a new paved road. Right in the heart of Ban Bungguang, on the corner of two main streets, we have 5000 m2 of construction land for sale. This land has been leveled out (at a higher, flood proof level) and is now ready for construction (guesthouse, all kind of business and/or private dwelling). Electrical power is running directly along that plot and water can be easily pumped up. Ban Bunguang has cellular telephone coverage from all Lao mobile phone companies as well as from AIS and DTAC from Thailand. 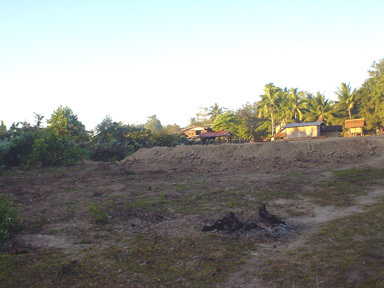 This piece of land is now for sale at only Baht 750'000.